Sign up for Broadjam today to follow Lab Ratz, and be notified when they upload new stuff or update their news! 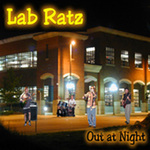 When the Lab Ratz experiment began in October, 2002, our goal was to bring an original sound to the live music scene. We didn’t want to be a cover band with a few originals or a “sounds like” band. Imagine taking the best music of the last forty years and putting it in a blender. After mixing thoroughly, what you get is the Lab Ratz sound. Because of the diversity of the musical influences among the band members (everything from Mozart to Hank Williams to Journey to Alice In Chains), we were determined to have no boundaries, no limits. If it’s hard to fit us into any one musical genre, so be it. If you love music, you’ll go home singing at least one of the songs you’ll hear at our shows. Since the release of our self-titled, self-produced five song demo in mid-June, 2003, the Lab Ratz have been playing in front of packed venues in and around Greensboro, NC. We’ve done it all ourselves playing nothing but our original music. When the music speaks, people listen.